This week I’m still keeping it really basic as the idea of the Tuesday Tip is not to showcase wonderful complex food, but rather to teach the very basics. It will get more complex but for now it’s all about gaining those basic skills that will make you more confident and happier in your kitchen. So peppers, I chose peppers this week after I was asked how to cut them without the seeds going everywhere, plus I was astounded that the person who asked me threw the top of the pepper away! With no waste in my kitchen I thought I need to get on to this food wastage and teach this guy how to chop a pepper. Peppers are fruits related to chilli family. They come in a variety of colours ranging from green, through yellow, orange and red. The reason for the rainbow of colours is simple, the pepper changes colour as it matures. The green peppers are the younger peppers who if left a little longer they change colour. The more mature the pepper the more natural sugar it will have and therefore it will taste sweeter. Green peppers are usually cheaper because the farmer has had to look after them for a lesser amount of time. I like to use green to boost my fibre intake! Pretty simple really, make sure the pepper is firm with a good colour and that it is not wrinkly or blotchy. From the supermarket they tend to be really glossy, I get mine from an organic delivery so they’re usually a bit dirty but after a good wash they’re glossy too. I keep mine in the fridge and they last usually up to a week. If my pepper goes a bit wrinkly, I just cut that bit off and use the rest. Peppers are so versatile that I could be here all day telling you about dishes, so I’ll keep it simple and choose 3. Raw, chopped small and added to salads, salsas or rice. I’ve been using more green peppers since learning about them from MC&L, as they contain less sugar albeit natural then their red and yellow brothers; chop green peppers really small so you get the crunch without the bitter taste. Roasting or grilling them until the skin goes black and blistered is another great way to cook them, remove the skin and add to almost anything, soups and hummus especially, for a lovely smoky dimension to your dish. Finally stuffing. Peppers are also great when stuffed with rice, chicken and/or veggies. We’ll have some stuffed pepper recipes coming up soon so watch this space. 4. Pull the stalk clean out of the top and trim the underneath if required. That’s it! 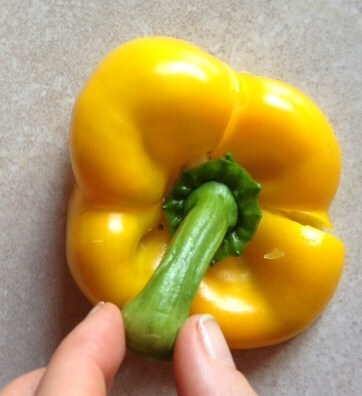 a simple way to cut a pepper without seeds going everywhere. What you do next really depends on what you are cooking. If using salad or stir-fry, lay the pepper out flat and slice down into strips, I like to use thick strips for stir-fry and thin for eating raw. 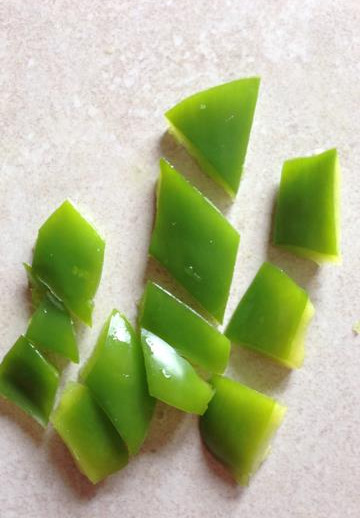 If you want to make neat cubes, then bunch the peppers up and cut across them horizontally; I’ve attached a picture of ones I used in a salad and ones I used in a stir-fry.